Pretty Link is a WordPress plugin that you can use to create shortened links to anywhere on the web, but using your own domain. You enter the full link of the target page and the short version you want to use on your own domain, then when the “pretty” version is clicked it actually goes to the full version. This replaces services like bit.ly and goo.gl with much nicer links that look related to your own domain and with much better management and tracking. I use this all the time for a huge range of purposes and it is great for managing and tracking clicks on your affiliate links. There is also a “Lite” version of Pretty Link that is free of charge and maybe a good place to get started. 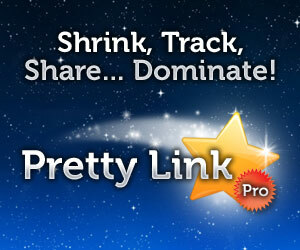 Have you used Pretty Link or any other URL Shortening software?